Are you looking for an economical, effective way to incorporate dissolved oxygen into your irrigation water? Incorporating air or oxygen into irrigation water using nanobubbles can improve crop yields and reduce susceptibility to disease pathogens. What started out as a way of making wastewater treatment systems more efficient with oxygen enrichment has expanded to how nanobubble aeration technology can improve production of agricultural crops. Moleaer Inc. in Torrance, Calif., filed a patent on nanobubble aeration technology in 2016 with the intention of using it as a way to deliver gas in a number of different applications. Continue reading Are you looking for an economical, effective way to incorporate dissolved oxygen into your irrigation water? What are the benefits of maintaining the optimum substrate oxygen level? 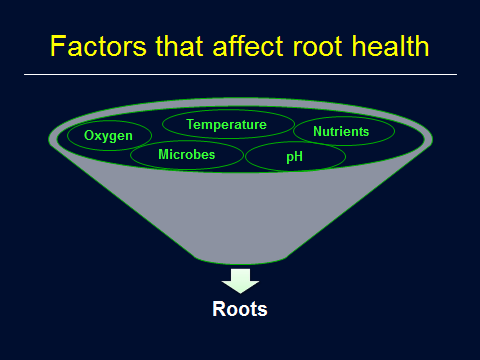 Increasing the oxygen level in the root zone can ensure healthy root growth and can impact crop yields. Low oxygen levels in the growing substrate can play havoc with the health of both vegetable and ornamental plants. Shalin Khosla, greenhouse vegetable specialist at Ontario Ministry of Agriculture, Food and Rural Affairs in Harrow, Ontario, said a substrate oxygen level below 5 parts per million can have a negative effect on plant growth. Continue reading What are the benefits of maintaining the optimum substrate oxygen level? Hort Americas is excited to announce that it has been appointed the exclusive distributor of the Moleaer Inc. nanoBoost Nanobubble Generator. The generator delivers a supplementary source of dissolved oxygen that can significantly increase plant growth, improve size uniformity, reduce stress and prevent root diseases under extreme production conditions. It is ideally suited for horticultural applications including hydroponics, greenhouse irrigation and pond management. Hort Americas installed the 50-gallons-per-minute (GPM) nanoBoost in in its hydroponics demonstration greenhouse in Dallas, Texas, to improve the production of leafy greens and culinary herbs during the summer months when warm summer temperatures make production more difficult. The self-cleaning nanoBoost Nanobubble generator, which has no moving parts, produces oxygen-enriched nanobubbles that efficiently oxygenate an entire body of water and provides a reserve of oxygen encapsulated within the bubbles. The generator delivers billions of nanobubbles with 200-times the inter-facial surface area when compared to micro bubbles, making them far superior in transporting valuable oxygen to the plants’ root system. The surface of the nanobubbles is negatively charged, attracting nutrient salts and enhancing nutrient uptake. Nanobubbles also increase the mobility of water molecules, potentially improving plant transpiration. The generator is available in various flow rates and is fully encased in a durable, NEMA4-rated weather-tolerant PVC shell. The unit is self-cleaning and features plug-and-play installation with no moving parts, thus ensuring long-lasting durability with minimal maintenance. The generator can be configured with an integrated pump or retrofitted with a customer’s existing pump to maximize energy efficiency. 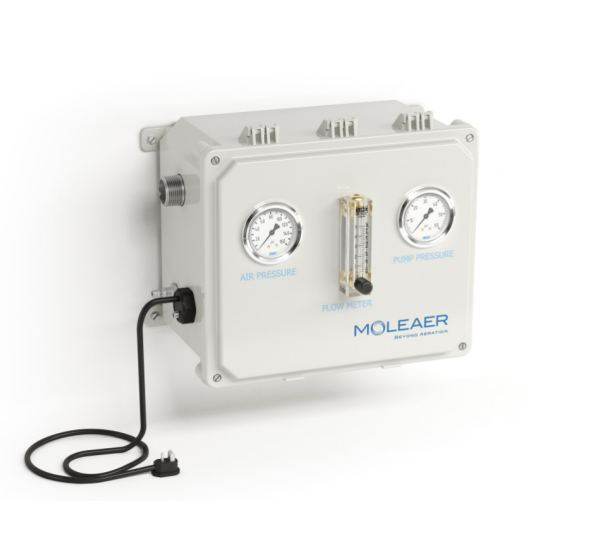 Moleaer Inc., the leading manufacturer of industrial scale nanobubble generators, expands its innovative product line with the new nanoBoost Nanobubble Generator, ideally suited for applications such as hydroponics, pond management, and irrigation. Are you maintaining the proper oxygen levels in your hydroponic production system? Growers have affordable options for ensuring plants receive sufficient oxygen in hydroponic production systems to maximize growth and to reduce the chances of disease. Oxygen is critical in the development and growth of edible crops grown in hydroponic systems such as nutrient film technique (NFT) and deep water raft culture. Tyler Baras, special projects manager at Hort Americas, is studying methods of adding oxygen to both conventional and organic hydroponic production systems in the company’s 12,000-square-foot research and demonstration greenhouse in Dallas, Texas. “One of the big differences is how growers add oxygen,” Baras said. “A lot of times in conventional hydroponics, growers use air pumps and air stones to add oxygen. In organic systems these tend to be hot spots for biofilm development. We have removed all air pumps and air stones from the organic systems we are trialing. 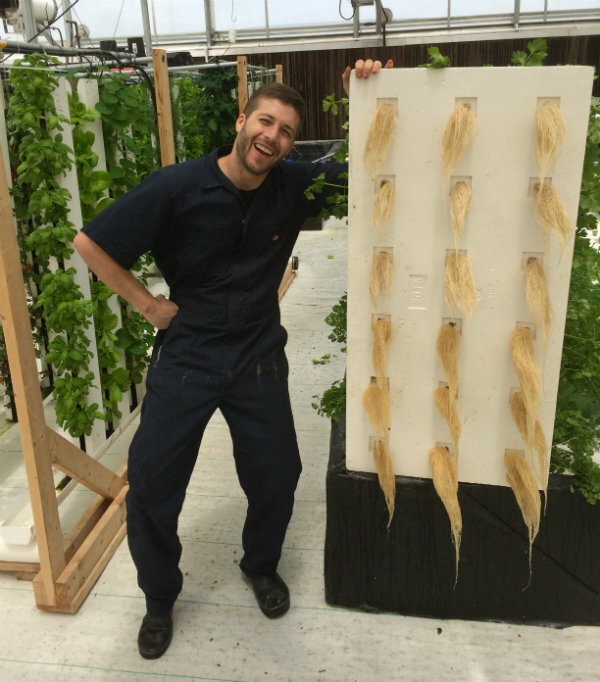 Tyler Baras, special projects manager at Hort Americas, is studying methods of adding oxygen to both conventional and organic hydroponic production systems. In the conventional production systems Baras is studying he has installed water pumps with a Venturi attachment to add oxygen to the nutrient solution reservoir. A method that organic growers use to increase oxygen levels is cascading the water when it returns to the reservoir. As water returns it is allowed to fall and break the surface of the reservoir so that the water can pull in oxygen. “This can also be done in vertical farms where the water will fall down large return pipes to the reservoir,” Baras said. “This can happen in multiple stages where the water will drop several times. This is an effective method for increasing dissolved oxygen. Baras said oxygen is necessary for plant roots to perform metabolic processes. As the flow rate increases in a NFT system, more oxygen is delivered to the roots so water isn’t sitting in the channel as long. Baras said the need for oxygen in an organic hydroponic system is even more important because of the presence of living microbes in the fertilizer solution reservoir. Baras said most of the oxygen measurements he has been taking in his research have been showing very similar oxygen levels for both conventional and organic production systems when the crops are performing well. Although most hydroponic growers are concerned with maintaining adequate oxygen levels, Baras said if too much oxygen is added to the solution it can cause root stunting. “I haven’t reached that threshold yet in my trials,” he said. “It’s crop dependent on what that level is. When there is too much oxygen the roots have less motivation to grow larger because they are getting everything they need with a smaller surface area. That can then translate to the plants producing less biomass resulting in less leaf tissue. So at some point too much oxygen can actually cause less growth. For crops like tomatoes, peppers and cucumbers the whole plant would be stunted. Baras said growers using a deep water raft system could try increasing turbulence in the pond to increase oxygen level. However, too much turbulence can sometimes cause damage to the roots. Increasing turbulence in a deep water raft system can increase the oxygen level. But too much turbulence can damage roots. For more: Hort Americas, (469) 532-2383; https://hortamericas.com. While providing the proper soluble salts and pH levels are important in hydroponic systems, don’t overlook the significance of maintaining the optimum temperature, oxygen concentration and microbe level in the nutrient solution. Maintaining the proper soluble salts (electrical conductivity) level and pH are critical in hydroponic systems like nutrient film technique and floating rafts. While monitoring these properties are important, growers should not overlook the importance that temperature, oxygen level and microbial activity play in the growth of plants in these production systems. 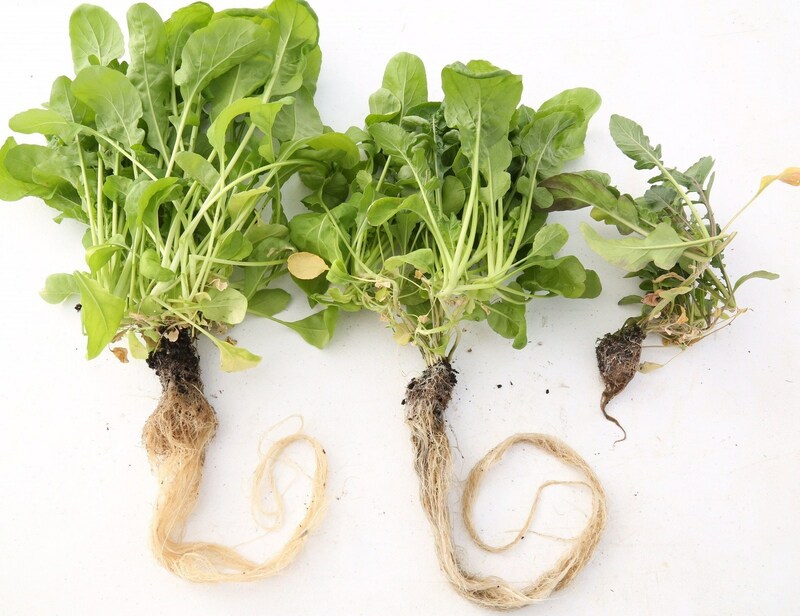 Factors that can impact root health in hydroponic systems include soluble salts, pH, temperature, oxygen level and beneficial microbial activity. Photo courtesy of Rosa Raudales, Univ. of Conn. While providing the proper air temperature in a greenhouse or controlled environment agriculture system is important, maintaining the optimum root temperature can have a bigger impact on the health and production time of a crop. “If higher temperatures are maintained in the root zone then the plants are going to lose a lot of energy,” Raudales said. “Temperatures above the optimum in the root zone affect the cell membrane integrity of the roots. A disruption of the cell membranes affects the function of the roots resulting in less nutrient uptake, which affects crop cycles and yields. Cornell University researchers have conducted studies (http://www.cornellcea.com/attachments/Cornell%20CEA%20Lettuce%20Handbook%20.pdf) to identify the specific temperatures that are ideal for hydroponically-grown vegetables. “Cornell researchers found the temperature of the nutrient solution had a greater effect than the air temperature,” Raudales said. “Lettuce plants exposed to air temperatures ranging between17ºC (62.6ºF) and 31ºC (87.8ºF) had consistent yields as long as the nutrient solution had a consistent temperature of 24ºC (75.2ºF). This research was done in the 1990s, but it still has application today. Raudales said growers who are producing hydroponic leafy greens like lettuce and spinach have the option of installing a water heater to maintain the optimum root temperatures. Raudales said the dissolved oxygen level in a hydroponic solution needs to be maintained so respiration can occur in the roots. Raudales said there is also an inverse relationship between the oxygen level and solution temperature. Raudales said growers who are using nutrient film technique systems typically don’t need to do any type of aeration. The movement caused by the flow of the water is usually enough to keep the oxygen level high enough in the solution. Raudales said growers who are using floating rafts usually incorporate some type of oxygen-generating system. Growers who are using floating rafts usually incorporate some type of oxygen-generating system to ensure the oxygen level is 6 parts per million or higher. Raudales said another reason for maintaining a high oxygen level in the hydroponic solution is the effect it can have on pathogenic fungal zoospores. “If there is more oxygen, then zoospores don’t survive as well,” she said. “Zoospores don’t want completely anaerobic conditions, but they do better in conditions where there is less oxygen. Pathogens of concern include Phytophthora, Pythium, Thielaviopsis basicola and Xanthomonas. Raudales said growers who are using floating rafts should be measuring the oxygen level regularly. Meters for measuring dissolved oxygen look like pH meters and are simple to operate. Raudales said beneficial microbes are present naturally in water. 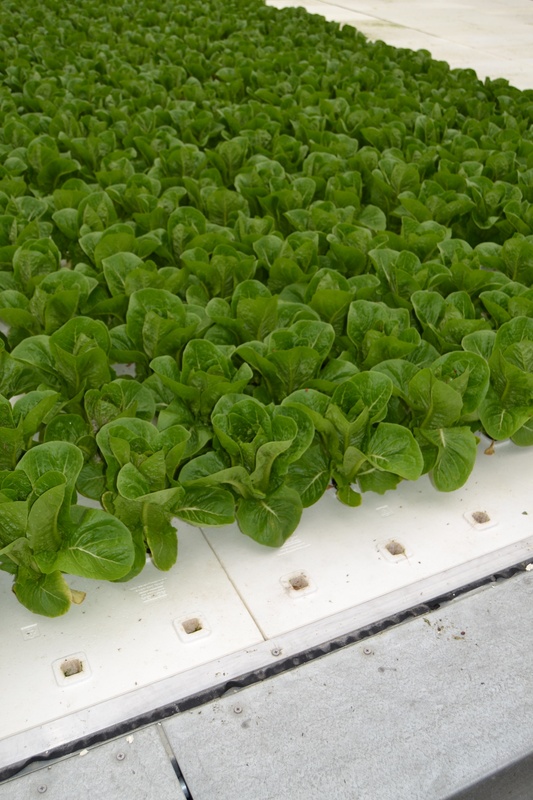 Commercial products with beneficial microbes can also be incorporated into the hydroponic solution. “Growers who are using the floating rafts tend to treat the nutrient solution like gold,” she said. “They don’t want to replace it because they have a solution which is very high in beneficial microbes. Growers can inoculate the nutrient solution with a commercial biocontrol product or they can allow the good microbes to build up with time. “As long as growers maintain the other parameters at optimum levels, including root temperature, pH, nutrients and oxygen levels, there typically isn’t a problem with diseases. This is very comparable to what happens with plants grown in substrates. The microbes build up naturally in the water just like in a substrate. These microbes feed on the exudates of the roots. For more: Rosa Raudales, University of Connecticut, Department of Plant Science and Landscape Architecture; (860) 486-6043; rosa.raudales@uconn.edu; http://www.greenhouse.uconn.edu.